With Fusion Drive in your iMac, disk-intensive tasks — from booting up to launching apps to importing photos — are faster and more efficient. That’s because frequently used items are kept at the ready on speedy flash storage, while infrequently accessed items go to the hard drive. The file transfers take place in the background, so you won’t even notice. To be clear, this is not a caching concept, at least not in the current use of the word. Cache would imply that the data on the SSD is duplicated, and it's not. If you have a 1TB mechanical drive paired with the 128GB SSD, you have a 1.12 TB storage platform. This truly is the fusion of all the space on two separate disks. Ars Technica compares it to an enterprise feature called Automated Tiered Storage. In a caching solution, like Intel's, files live on the hard disk drive and are temporarily mirrored to the SSD cache as needed. In an enterprise auto-tiering situation, and with Fusion Drive, the data is actually moved from one tier to another, rather than only being temporarily cached there. The Mac Observer reports that there are two separate drives that appear as one logical partition. As a result, if your Hard Drive fails, it could be replaced with a 3rd party drive and reconfigured as a Fusion Drive. Meanwhile, they note that all writes take place on the SSD drive, and are later moved to the mechanical drive if needed, resulting in faster initial writes. The Fusion will be available for the new iMac and new Mac mini models announced today. How would having a 256GB SSD replacing having a 1TB or 3TB hard drive? Personally, an SSD boot drive and separate large HD seems more practical. No need to "fuse" them into one volume. Just seems like asking for trouble. This feature is perfect during this HD to SDD transitional period. It'll keep things affordable while still supplying great performance. and most likely that's exactly what it is. It has been available on PCs for a while. 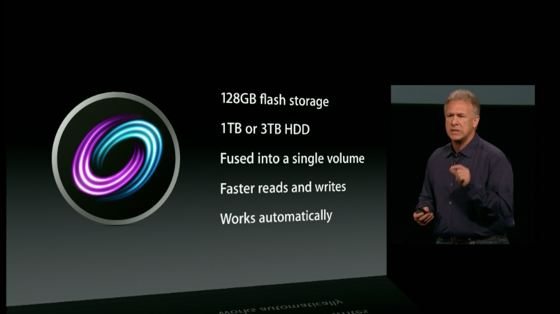 The fusion drive is just software to automatically handle that. Most consumers probably don't want to have to deal with having a boot drive and a data drive. Some things can be tricky to get onto an external drive, like iTunes and iPhoto libraries. Very interesting, though I'm wondering what if one of those drives fail. Is your data retrievable from the other one? The Mac Observer (http://www.macobserver.com/tmo/article/digging-into-fusion-drive-details?utm_source=dlvr.it&utm_medium=twitter) reports that there are two separate drives that appear as one logical partition. As a result, if your Hard Drive fails, it could be replaced with a 3rd party drive and reconfigured as a Fusion Drive. Don't mistake it though. You'll still lose all your data. Way cool technology aside, is anyone else curious how VMWare feels about the name? Fusion Drive is the first "wow" moment I've had during an Apple PR event in a long time, probably not since the original iPhone launch (when it was more like one hour-long wow). It shows they are still doing some innovation beyond "making it lighter and thinner". If they'd sell an internal combo drive that had SSD + HDD included in one 3.5" enclosure, I'd buy one right now. The Fusion will be available for the 27-inch iMac and new Mac mini models announced today. According to Apple's specs page, it's also configurable on the high end 21.5" iMac as well.